I LOVE salads. My grandpa always had a salad with dinner. ALWAYS. And when there were leftovers I usually helped finish it off back in the kitchen before we all did dishes. My grandpa was an awesome cook and some of my favorite memories are helping him make dinner, being around the table eating his dinner, or sitting at the table with a full stomach and an empty plate listening to him tell stories after dinner. The thing about my grandpa’s salads though, was that they were redundant. You could always count on having iceberg lettuce with diced green bell pepper, tomatoes, cauliflower, carrot peelings and buttermilk ranch dressing. Now I’m not complaining about having a consistent salad as a side at dinner, even if it was predictable. And let me tell you, no one else ever complained either. But as I got older I realized that salads can be a whole lot more fun if you mix it up a bit. Unfortunately my grandfather passed away before I was able to do very much cooking for him, but I’m thinkin’ if he would have tried a few of my salad recipes, he would agree. Let’s be honest, a salad has to be one of the all-time easiest things to make for a quick, healthy lunch. If it’s a fabulous salad you would be willing to eat it for dinner too. And I’m not talking about a salad on the side, but a salad for dinner. Period. I think that all of our favorite salads can be used for dinner, especially if you choose to add shredded chicken, which we usually do. 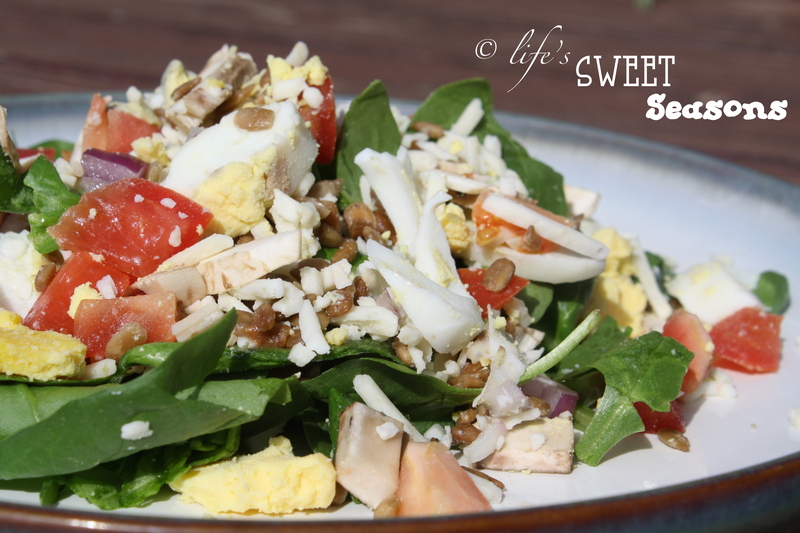 This recipe, like most salads, is pretty simple. The hardest thing you’ll have to do is boil an egg. Okay well, boil two or more eggs, depending on how many people you plan to feed. One of the greatest things about a salad is you can add or omit various ingredients to fit your liking. What’s great about this is the combination of flavors. The chicken, eggs, and mushrooms help give it the “meatiness” (sure, it’s a word) that satisfies you through lunch. The pepper jack cheese adds a kick while the poppyseed dressing keeps it sweet. I’ve even added diced Granny Smith apples to this before which was delicious, but I didn’t add it to the recipe so I wouldn’t freak people out. 🙂 Haha. Enjoy! I trust that you can make hard boiled eggs. Make two. Allow them to cool and then put them in the fridge to make them easier to peel. Wash spinach and tear with hands and place in bowls or on plates. Top spinach with diced tomatoes, red onion, a few mushrooms, and a sprinkle of sunflower seeds. I’m glad you like it! Thanks for your comment.